Instant Replay Review overturned 1B Umpire Mike DiMuro's out call in the bottom of the 5th inning of the Mets-Diamondbacks game. With one out and one on, Diamondbacks batter A.J. Pollock hit a 0-1 slider from Mets pitcher Jenrry Mejia on the ground to third baseman David Wright, who threw to first baseman Lucas Duda as Pollock arrived at first base. 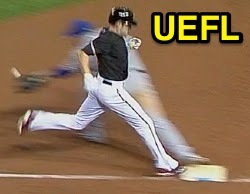 Upon Instant Replay Review as the result of a challenge by Diamondbacks Manager Kirk Gibson, DiMuro's ruling that Duda caught the ball and tagged first base prior to Pollock's touch arrival was reversed, the call was incorrect. At the time of the review, the Mets were leading, 9-0. The Mets ultimately won the contest, 9-0. This is Mike DiMuro (42)'s second Instant Replay Review of 2014. Mike DiMuro is now 0/2 (.000 Affirmation Rate) in Replay Reviews in 2014. Crew Chief Jerry Layne's crew is now 6/10 (.600 Affirmation Rate) in Replay Reviews in 2014. This is the 92nd Instant Replay Review of the 2014 MLB Regular Season. Diamondbacks Manager Kirk Gibson is now 1/2 (.500 Success) in Instant Replay Reviews during 2014. Umpires are now 60/92 (.652 Affirmation Rate) in Instant Replay Reviews during the 2014 MLB season. Jeff Nelson just tossed Padres hiting coach Phil Plantier in between the 5th and 6th innings.